Special distributor Sentai Filmworks has obtained the license to distribute legendary anime (and Super Sentai spiritual ancestor) “Science Ninja Team Gatchaman” in America! All 105 episodes and three O.V.A. releases will be included in the special DVD & BluRay box sets. At the moment price is not available but release date is estimated for October. While not a Tokusatsu, seeing as this is an animated series, the show has been related many times over to the Super Sentai franchise. And a live action film starring several tokusatsu alumni, not least of which being Tori Matsuzaka (Shinken Red), will be released later this year! The Official Site of the new Gatchaman project is now streaming a new promo for the film! Thanks to member xSkullheartx for the heads-up! 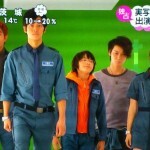 Japanese talk show Zip! 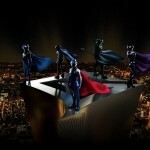 has provided fans with an early look at the forthcoming live-action Science Ninja Team Gatchaman movie. Based on the anime by Tatsunoko Productions, this series is perhaps better known in the West for the adapted series Battle of the Planets! The movie stars Tori Matsuzaka (.hack//The Movie, Samurai Sentai Shinkenger) as Ken the Eagle, Go Ayano (Kamen Rider 555, Rurouni Kenshin) as Joe the Condor, Ayame Goriki (Mirai Nikki, IS) as Jun the Swan, Tatsuomi Hamada (Ultraman Zero, Gokaiger vs. Gavan) as Jinpei the Swallow and Ryohei Suzuki (Hana Kimi) as Ryu the Owl. 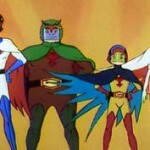 Science Ninja Team Gatchaman is due for release in Japan on August 24, 2013. In the meantime, check out the video below and the larger image of the main cast after the jump! That’s right, Gatchaman, the classic anime that Choujin Sentai Jetman paid homage to, is coming to the big screen! 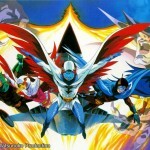 Also known as G-Force and Battle of the Planets here in the US Gatchaman is making it’s Tokusatsu debut! After a series of awesome live action commercials in the early 2000’s fans have clamored for a live action take on the series for years. Finally their wishes are coming true and we welcome Gatchaman to it’s new home at TokuNation! We’ve got some awesome Toku alums taking part in this project and with the rather big names we have on the production staff this film is gonna be something special!